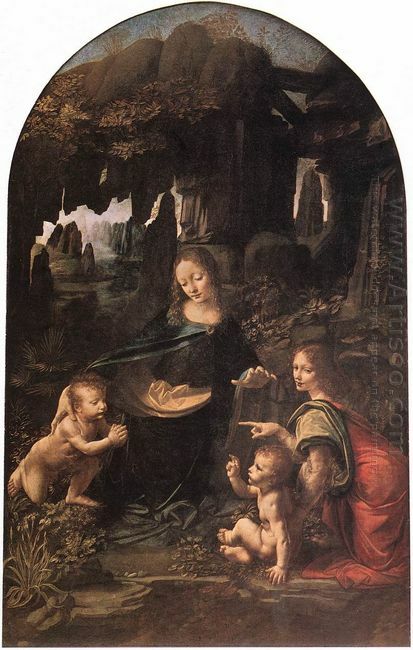 In oil painting Virgin of the Rocks, Leonardo Da Vinci used a pyramid composition with a sense of stability. Four people were united in this stable structure. The peak part was just the head of the virgin and the right contour edge of the pyramid was Jesus's left hand and angel's clothing. But such pyramid contour was not a very rigid symmetry formula composition, whose central figure virgin still tilted towards the left and lower part of the pyramid composition was close to the prismatic; John's head was slightly lower than the head of the angel. Because the light of the background cave was strengthened, their color contrast remained stable. Panorama was very serious and natural with classical features. We should also pay attention to the background depiction:Leonardo da Vinci is not only an excellent landscape painter, and more importantly he pays great attention to the rock structure within the cavities. The inside stalactites, for the scientific researchers in the Renaissance era, is a subject explored by the geology. Here it further reflects the broad interest of da Vinci of the knowledge of geological formations. In the 15th century, in all the Italy murals, general characters were always placed in front of the landscape, rather than in the landscape. Da Vinci for the first time placed figures in the center of a certain landscape, which made the experience of figures and the dark ancient cave into a whole. It was an original innovation in the pursuit of typical environment and character in the conception. In tone, the whole painting took brown as the key note and the dark green of the virgin and the purple of angel's cloak made a contrast to the gold and silver. The skin of Jesus and John formed a contrast with the golden hair of John. The dark cave enabled da Vinci to play the shading contrast rule into full play. Virgin of the Rocks was full of signs and symbols, showing the mysterious soul of da Vinci. What did the angel's clear pointing to John mean? Did St John protected by the virgin represent the human needs of protection of Holy Spirit? Did uterus-shaped cave imply the origin of life? Scholars made a heated discussion about these issues. 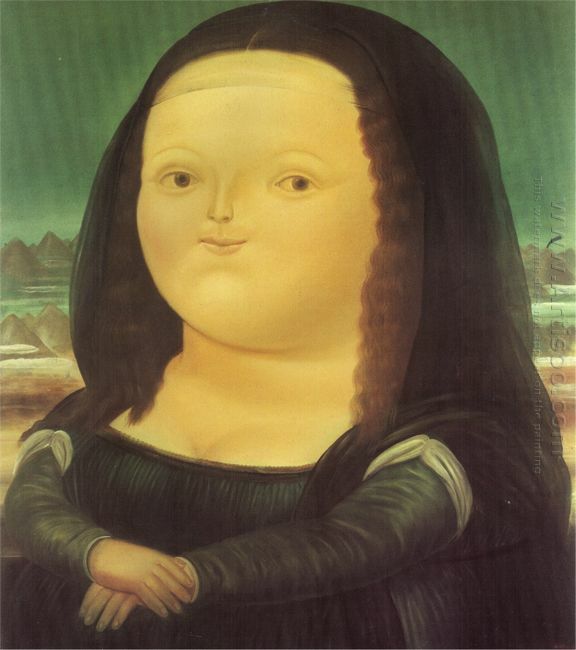 However, like all great artists, da Vinci never explained the meaning in his works. He believed that the spectators would feel the meaning which was not described by words. 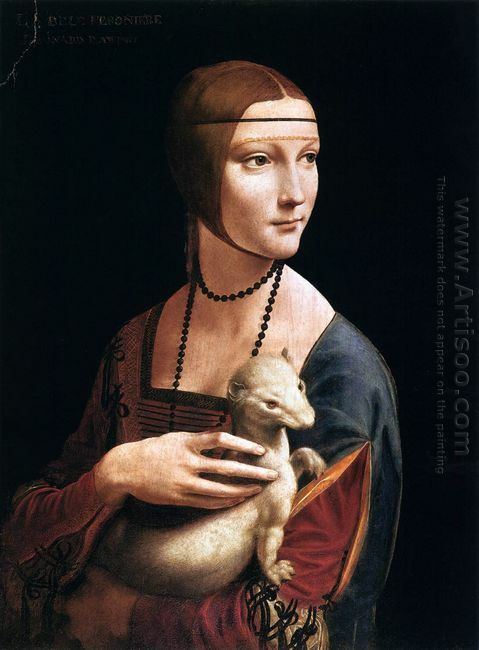 Apparently da Vinci integrated his past learning experiences in this work. 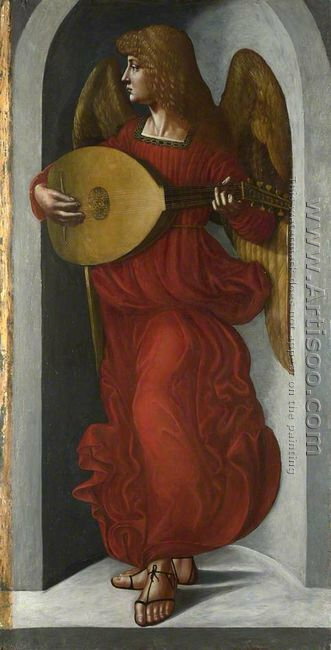 An Angel in Red with a Lute by Leonardo da ..
An Angel in Red with a Lute is a great painting created by universal genius Leonardo da Vinci, .. The Tribute Money The Tribute Money was a painting of a religious subject large mural .. This entry was posted in Oil Painting, Renaissance and tagged artistic characteristics, Leonardo Da Vinci, religious oil painting. Bookmark the permalink.